Nino’s AQ Is Going To Open Any Minute! Astoria has every food imaginable available, but good pizza is one of those few items that seems to come and go too frequently. 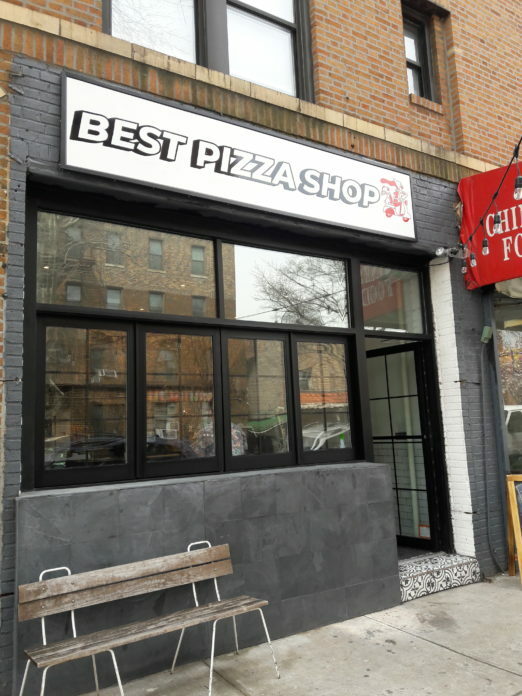 Well, hopefully here to stay is the new “Best Pizza Shop” on 34th Ave which just opened on Thursday 4/4 (coincidentally in the former Fat Cat’s Pizza Parlor location). First off, with a name like that you’ve got to be confident! Best Pizza Shop comes from the owners and creators of Gastroteca Astoria and Astoria Provisions. Chef/Owner John Parlatore said they’re taking more of a baker’s artisanal approach, and gave us the lowdown on the new pizzeria and what neighbors can expect. Best Pizza Shop will serve both round and square pizzas, with a focus on individual square pies cooked in blue steal pans (which are similar to cast iron but are lighter and pre-seasoned, so you can expect a nice, crispy crust). Slices of both will be available—ranging from $2.50 to $4.50. Hours will be 11 a.m. to 11 p.m. daily, or until they run out of dough for the day. 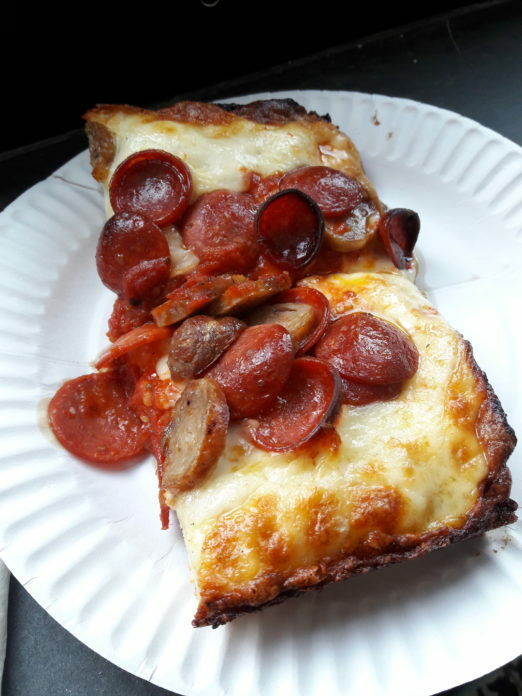 We tried the sausage and pepperoni signature square slice. They source organic flour from Central Milling Co in Utah, and let the dough ferment for five days and then let it rise for three hours before baking it. Parlatore said they were looking for more space to bake, as the Astoria Provisions kitchen needed to be more focused on serving the dining clientele. So, this new shop will bake all the bread for their other stores as well as the sandwiches served at the pizza shop. 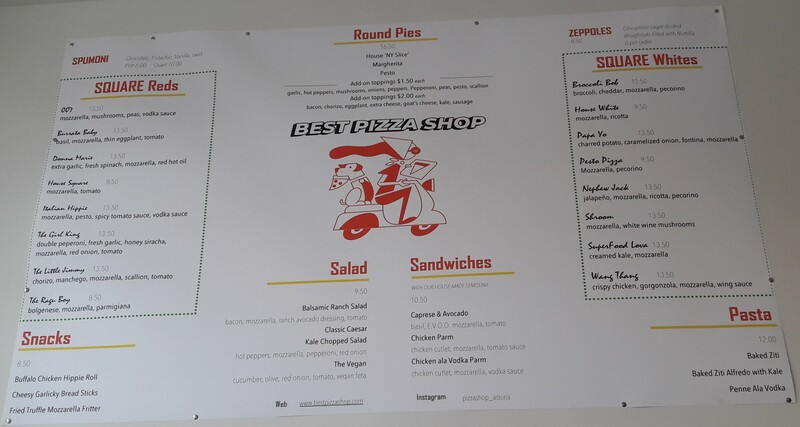 The website will be live soon (www.bestpizzashop.com) and the phone number is 718-806-1553. 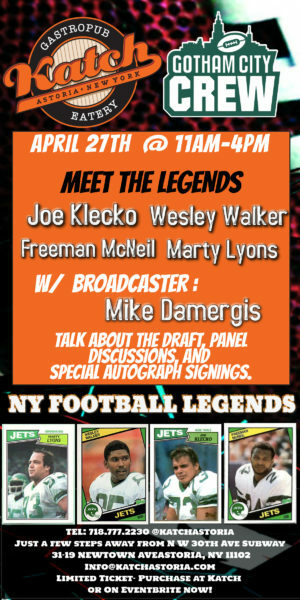 Delivery will be available in the next few weeks. Anyone try it yet? Will Best Pizza Shop rank in your favorite pizza joints in the neighborhood? Let us know in the comments! Well Lynn, good work. I’m not at home any longer living in my flat under the elevated not far located from Steinway. Instead residing in Los Angeles whereupon, contimplating the airfare and travel expense for I crave New York pizza you, have not helped matters! I guess I’ll have to see, but currently my fave pizza is Tuffino’s pizza margharita. The ones at Milkflower are also excellent! The name of this shop isn’t similar with the shop of the same name in Williamsburg at all.